The Information, Communication and Technology (ICT) Steering Committee covened its first meeting on Thursday, April 12, 2018. 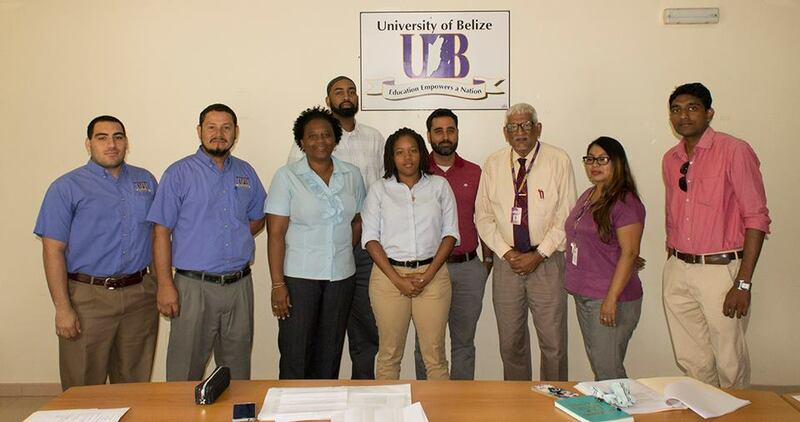 The objective of the committee is to provide overall oversight, guidance and direction of ICT policies, ensuring that the Department operates with the direction of the University of Belize. This high-level oversight body will be guided at all times, by the principles of transparency, accountability and fairness in the discharge of its responsibilities. The Committee is composed of representatives from ICT Department, the four faculties, students, Finance, ODL, Registrar and Human Resources. Professor Emeritus Clement Sankat thanked everyone for their support and in turn assured them of his support to the work of the committee. The Committee is chaired by ICT Director, Mr. Abdulaziz Sanderson. It was really a Cultural Extravaganza last night at the fifth edition of Evening of the Arts. 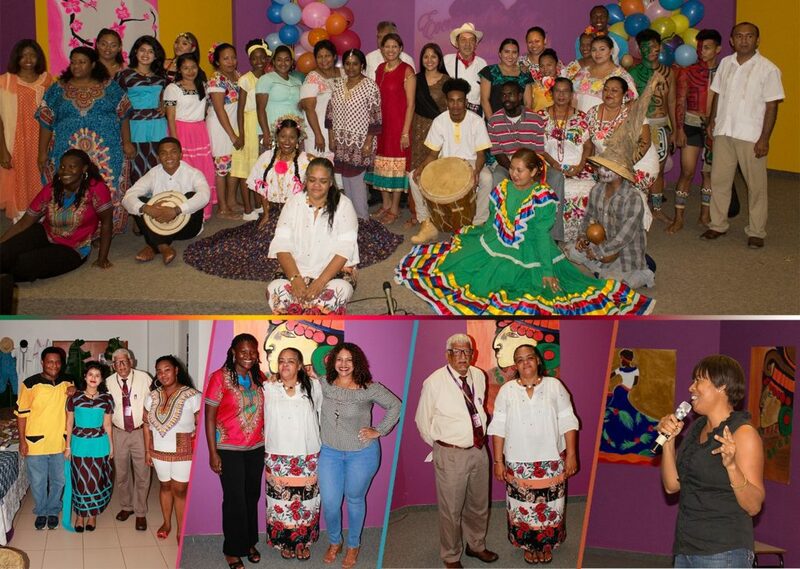 The Faculty of Education and Arts held it’s Evening of the Arts under the theme “Celebrating Our Belizean Identity: A Multicultural Extravaganza” at the Jaguar Auditorium. The Evening started with a display on the different cultures in Belize. The students dressed in cultural attire explained different aspects of the culture they represented and shared samples of the traditional food. After the display there was a ceremony that treated the audience to cultural performances. Lecturer, Tracey Sangster welcomed everyone. The big announcement came from Dr. Virginia Hampton, Chair of the Language and Literature Department, who said that this edition was being held in honour of Mrs. Sangster who is retiring. The directors of the ceremony were two former students of Mrs. Sangster, Courtney Weatherburne and Kadijah Marin. There was presentation on a history of the Maya by Mr. Ryne Carillo and “Cultural Woman” Ms. Felicita Cantun spoke on the traditional Maya ball game ‘Pok-A-Tok’ and shared the news that the Belizean team are the current champions after playing in a tournament against Mexico and Central American countries. Two members of the team gave a demonstration of the game and lecturer Mr. Steven Lewis also gave it a try. Eniza Orellano performed a Mestizo Dance while Kenny Toribio and Nedelca Mariscal from the Regional Language Center shared a Panamian Mestizo Dance. The iconic Garifuna drums were also present when Preston Parchue and John Howard took the stage. Ms. Abbby Godoy, Ms. Edice Hua and Ms. Jacklyn Burns presented poems they had penned. There was also an East Indian dance by Dwayne Murillo. The Flores brothers, Aniki and Lynford, once again shared their rapping skills with the audience. To the surprise of everyone Ms. Ivory Kelly performed an outstanding rap. Serah and Shalom Lewis, daughters of the UB lecturers Steven and Sarita, also sang a song. 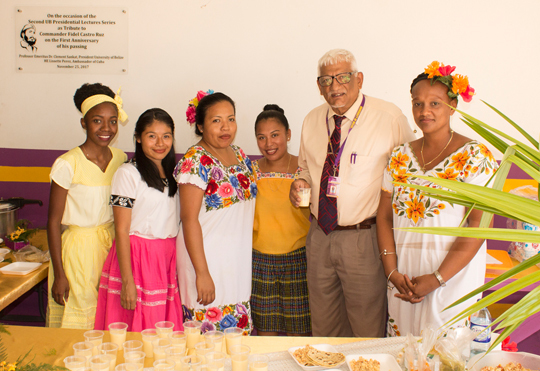 Professor Emeritus Clement Sankat took time to enjoy the great work of UB’s students and learned more about Belize’s cultures. He also commended Mrs. Sangster for an excellent job in guiding the students. The Belize Chamber of Commerce and Industry (BCCI) invited Professor Emeritus Clement Sankat to join them on their weekly segment on Love FM’s Morning Show on April 10, 2018. The representatives from BCCI were Ms. Kay Menzies and Mr. Dyon Elliott. President Sankat spoke on how University education can enhance productivity and competiveness. He was also given an opportunity to speak on the challenges and opportunities for the University of Belize at this time on its thrust for enhancing human development in the country. The President expects to meet with the BCCI shortly to share with them elements of our Transformational Plan Vision 2022. On a related note, Admissions Coordinator, Mrs. Camilla Allen-Barker, and UB Field Technician in the Faculty of Science and Technology, Justine Myvett, appeared on Krem Radio’s Wake Up Belize Morning Show on April 12 to promote the UB Open Day and Earth Day which will both be held on April 26, 2018.